TV Size: Most 32-65 inch TV, if the TV’s Wall Mount Plate VESA Size and Weight fit the parameter, the compatible TV size could be bigger. 1. Perfect fit for Curved TV and Flat TV. 2. Constructed with Articulating Arms: Great designed six arms ensure stability which is 4 times weight capacity and full motion allows maximum flexibility. 3. Extend between 2.8"/70mm to 18"/457mm from the wall, which helps to clean and collect the cables. Tilt 8 degree up and 12 degree down. Swivel 180°, (angle change depends on actual TV Size). 4. Adjust the angle in every direction for easy viewing from any seat in a room relieving fatigue of your cervical vertebra and lumbar vertebra fatigue. 5. 5 degree horizontal adjustment: you can fix the minor error while installation within 5 degree. 7. Cable management system: unsightly cables can be concealed effectively making the whole TV set clean. 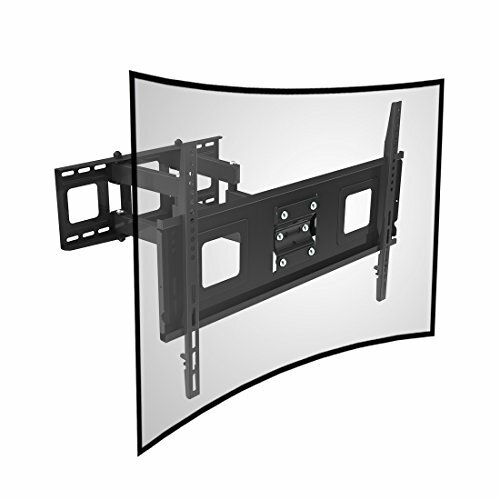 TV's distance to wall is from 2.8" to 18"; Tilt 8 degree forward or 12 degree backward; Swivel 180 degrees(angle change depends on actual TV Size). Heavy Gauge Steel material allows weight capacity up to 132 lbs. Four times weight capactiy, hold up to 4x132 lbs=528 lbs. Three Steps Installation: 1>Install the mount on wall. 2>Attach mounting brackets to TV. 3>Hang TV on the wall mount. No need assemble too many parts. Post-installation level adjustment allows the TV to perfectly level; Common hardware pack and 10-Year Warranty are included in the package.